NISO Midland branch held their presentation of certificates for the ‘Introduction to Occupational Health and Safety’ course in the Prince of Wales hotel in Athlone. Hosted by Athlone Institute of Technology from February to June, 16 participants successfully completed the course. These included people from Westmeath, Roscommon, Offaly, Cavan, Galway, Meath and KIldare. 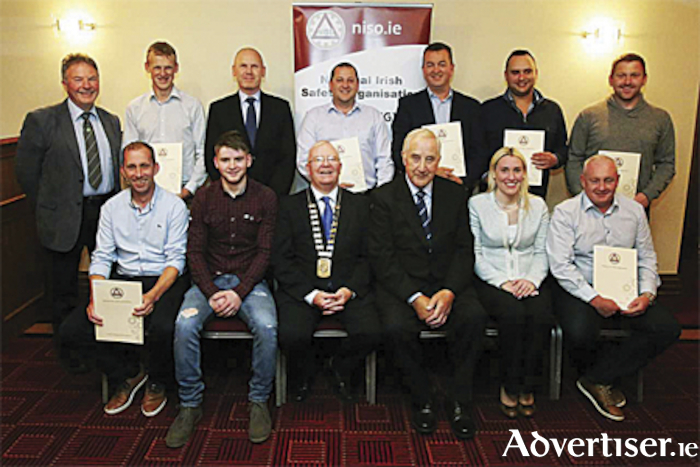 Each participant received their certificate from Mr. Harry Gavin, President of NISO with Midland NISO Branch Chairperson, Mr. John Flanagan overseeing the presentation. Dr. Don Faller, Dean of Faculty of Health and Science represented AIT on the night. The course will run again this autumn, beginning this week in AIT. A number of the participants will advance into the part-time Level 7 Degree in EHS Management in the autumn in AIT. To book a place on the NISO course contact the Lifelong Learning Department, AIT for further information on either [email protected] or [email protected] or (090 ) 6483052/3/4.